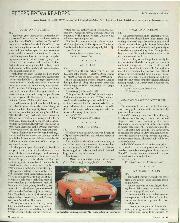 I enjoyed enormously October's article on Jim Clark. As it reveals, the relationship between Clark and Chapman was indeed extraordinary, but not without moments of tension. 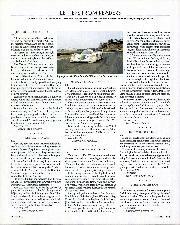 In the mid-'60s we used Snetterton frequently for testing. Lotus were regular users too. On an April day in 1964 we arrived to do some running-in, and the Lotus transporter was in the paddock. The circuit manager, the one-eyed sea-farer Ted Lusted hastened to warn us to keep a special eye on our mirrors because Jimmy was testing the Lotus 30. As we were preparing, Jim thundered past, braked late into Riches and was gone. Moments later Ted leapt into the circuit van — a sixth sense having told him something was seriously amiss. When the van returned a visibly pale and shaken Clark emerged. 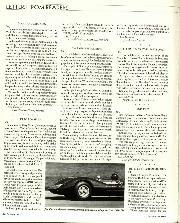 Apparently as he hit the brakes at the end of the straight there was a major suspension failure, and at 185mph, Jim and Lotus 30 waltzed toward the hairpin shedding bodywork and suspension. The car came to rest against the hairpin banking. We watched as Jim strode purposefully toward Chapman. Fixing his boss with an unwavering steely stare, Jim said quietly, "Colin, lets be very dear about one thing — if you're going to bloody build them like that, you can bloody drive them yourself." 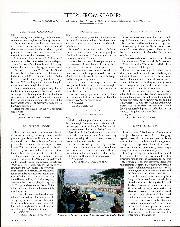 In contrast to Gary Dunn (Letters, October), I have not taken Motor Sport for 32 years. I bought October's issue for the picture of Jim Clark on the cover. The day before, I'd realised an ambition and visited the Jim Clark room in Duns, Berwickshire — a small, beautiful collection of photographs, trophies and story boards recounting his life in the sport. I wallowed in nostalgia for two hours and recalled his exploits as reported in Motor Sport. 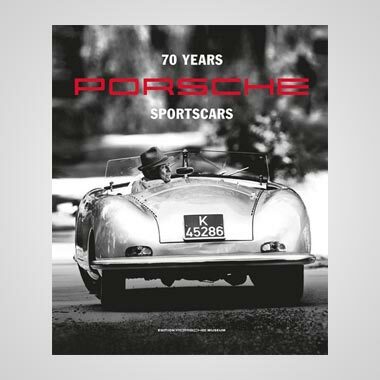 Far from finding October's issue off-putting, as with Gary, again I wallowed, with cars like the D-Type, Vanwall, Connaught, Cooper-JAP, Lotus, Maserati and drivers Brooks, Collins, the sad Lewis-Evans and McLaren. I loved it all! So you have a new subscriber. The balance between today and yesterday is spot-on if October is a sample. I haven't re-read a magazine so often since my first copy of Spick! Bill Boddy's article with the photograph of the Ballachulish ferry even reminded me of holidays in the North. My old man would power the family Rapier up Loch Lomondside and through Glencoe to be first at the ferry. He failed only once when the roof rack with my bike on it fell off at Tarbet! So keep up the good work and let the nostalgia flow. I shall now return to the back pages of Motor Sport, dream of winning the lottery and try again to decide if I should buy a 100BN2, an XK 120 or a Cobra. 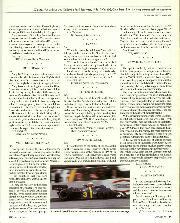 The article by Shaun Campbell on 'F1 Then and Now' was well researched and considered. However, as a long-time enthusiast, I felt that he has downplayed one of the sport's most important aspects. 'La Grande Geste': This was an era when drivers raced for their countries and beliefs, not for a cigarette company whose products they despised. Enthusiasts will always remember Collins giving his car to Fangio to give the Argentinian another world championship, destroying his own chances. They will also remember Moss testifying on behalf of Hawthorn over an alleged rule infraction. It ruined his chances to be world champion and gave the title to Hawthorn. La Grande Geste is more satisfying than seeing grown men deliberately crash to destroy each other's chances of success. Man mastering machine: because of the circuits and technology of the time, a great driver in the '50s could win in almost any car. You could see an Ascari, Moss or Fangio take over a team-mate's struggling car and do magic with it in a way that you do not see today. You could see a master driver start from last on the grid and though sheer ability force his way through the field to win. You could see a driver in an out-of-date private car take on the full might of the factory entries and beat them all. This gave far more pleasure than watching Grands Prix and even world championships being won or lost by a tenth of a second wasted in the pits. I was delighted to receive my copy of the November edition of Motor Sport to find you have decided to include some reference to contemporary Formula One in the magazine. Patience rewarded! I have always hoped you would come to this decision and I now live in hope that in due course you will include some coverage of the individual races. As regards the debate as to which is or was the 'golden age' of motor racing this is surely a subject that will run and run. There is of course a school of thought, not that I am altogether sure that I agree with it, that the best race is always the next one. 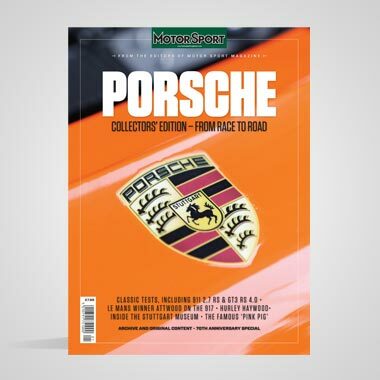 Keep up the good work with Motor Sport, which now contains some excellent material. In the November edition of Motor Sport, Shaun Campbell posed the question: "Was there ever a Golden Age of Grand Prix racing?" He also asked: "What gives it that distinction?" From my viewpoint the answer is simple. The golden age was in the mid-'60s when cars were still in national colours. In those days my only contact with the Grand Prix scene was through Motor Sport and I often had to buy two copies as I literally wore them out. Was this my golden age because of the new technology, mid-engines, monocoque construction, early experiments with wings and downforce? No, it was because I was young and still driving my first car and because it's all in retrospect! Shaun Campbell's article, 'The Power or The Glory?' expressed something close to my views on Grand Prix racing and, in view of your previously expressed views on the current state of Formula One, I admire your open mindedness in publishing it. I believe he could have extended his analysis back to the dawn of Grand Prix racing. There have always been vintage years and races and there have always been uncompetitive years and processions. 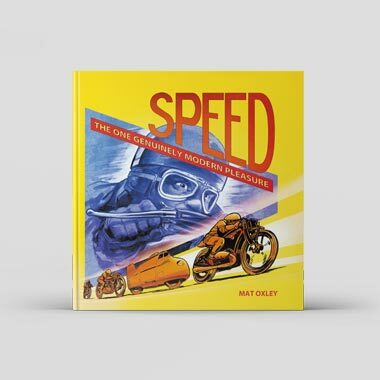 There remains scope for an occasional article, perhaps like of Jenks' Reflections, addressing conundrums, such as Irvine's speed at Suzuka, or Hill's near invincibility in Hungary. I've spent several Grand Prix Sundays this year taking part in events in old cars. Conversation invariably turns, sooner or later to the Grand Prix, which it seems that everyone has arranged to record for later viewing. Lest you should consider that your readership has lost interest in Grand Prix racing, we should hasten to disabuse you. Andy Bell's letter requires clarification for readers unfamiliar with the format of the Coy's Festival. Like other races the Pre-War Sports Car Race consisted of two eight-lap heats, with an aggregate result. Andy is correct in stating that two of the Ulster Aston Martins were quicker than the fastest Talbot 105 in the dry Sunday heat (by 13.84 seconds) but in the wet Saturday heat two Talbot 105s were 22.31 seconds ahead of the fastest Ulster. The organisers clearly took the view that the first and second places achieved on aggregate by two of the four Talbots entered merited the Team Prize, even though three Aston Martins finished in the top six places. The reaction to this recent Talbot victory at Coys surprises those who like me have known and loved these cars for years and remember Anthony Blight's great successes in the 1960s. The cars are increasingly visible in VSCC events, if under-appreciated more widely as potential competition cars. Having read Sheridan Thynne's letter about the incorrect photo in the October issue what do I find just below? A photograph captioned as a Mercedes at Donington. This must have been the only appearance of the secret rear-engined car which Mercedes-Benz disguised by fixing four interlocking circles to the radiator cowling in an attempt to convince the unsuspecting Brits that it was an Auto Union. I am delighted that you have revealed the truth in yet another Motor Sport exclusive! 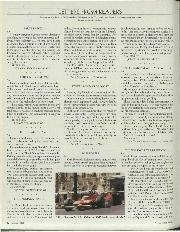 If I may add my views to the debate concerning F1 coverage, no one covered F1 as well as dear old DSJ. None of today's hype merchants come near though young Roebuck comes very close at times. I feel that modem F1 is a high-tech circus. If spectators and viewers are lucky they may get three good races a season. True races are won on the track, not at the petrol pumps. So please continue to omit Formula One and use the space for real motorsport. When the November edition of Motor Sport fell open at the feature on the Alfa 145 Cloverleaf, my eyes scanned the last words of the article to find our purchase is confirmed as a good one! We've only done few hundred miles so far, but it's a great car and with the optional leather trim and air conditioning it's also pleasantly luxurious. I understand the forthcoming 156 is likely to be available with an F1 paddle gearchange. The GTV with a similar set up would be rather nice too! In answer to Stewart Williams' letter, the Morris Special 'Red Flash' is to be found in the British Motor Industry Heritage Trust collection at Gaydon. It was not based on a Morris Commercial chassis but on a Moths Cowley chassis of 1925. For some reason the Heritage publicity persists in calling it an 'Oxford', despite the data on the identification plate which clearly says 'MC-11-9', indicating an 11-9hp Morris Cowley on chassis number 73424. I was interested by the profile of Lance Macklin in the November issue. However, I think Chris Nixon's suggestion of the "demise of HWM" in 1954 is misleading. HWM continued to enter works cars up to 1956 when John Heath was killed, and sporadically after that Indeed, Macklin, with Bill Smith as co-driver, took fourth place in the '55 Goodwood Nine Hours with HWM-Jaguar XPE 2. Incidentally, Bill Smith was one of the drivers killed in the 1955 Dundrod TT a month after the Nine Hours, in the accident which also involved Macklin. One has to agree with Andrew Frankel's analysis in the previous issue, that we lost a disproportionate amount of British talent in the 1950s. 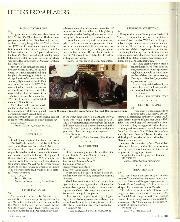 The update on the Tyrrell six-wheeler in the October issue prompts me to express some thoughts about that project. Reporting on its sole Grand Prix victory, Motor Sport commented that every other team was struggling with apparently incurable understeer on the Swedish track. It seemed to me that probably the only advantage of extra front wheels would be an abundance of grip. The wind tunnel experiment which made the most lasting impression on me as an aeronautical student at Imperial College in the '50s was the Wake Traverse, which computes drag on the model solely from crass-sectional mapping of the airflow speed downstream of the model. A more convincing way of demonstrating that drag is a fimction of the disturbance to the airflow I cannot imagine. Without wishing to under-rate Derek Gardner's talent, I believe that March's six-wheel car — with four rear wheels — was the right way to exploit the advantage of extra wheels. A major portion of any post-'60s GP car's drag must come from its huge rear wheels. For a long time, designers seemed to concentrate only on ever sharper noses for good penetration, leaving the back to look after itself. In 1959, I spotted a model of a front-engined BRM car in one of Imperial's wind tunnels, and commented to one of those involved that the design would probably have less drag going backwards! A little while later, I again caught a glimpse through the open door, and the model had been turned around. No one would admit the drag was less, but they did not deny it either! In your coverage of the Peking-Paris Rally, you say Pakistan has never before witnessed international motorsport and that it was "...the first international rally to cross Iran." May I correct you? I was a participant in the Manchester to Bombay Rally of May 1994 when 14 vehicles stormed through both these countries.